Interestingly, their takeout menu is completely different from the dine in menu. The chicken caprese on the takeout is fantastic. Sauté chicken, fresh mozz, tomatoes in light marinara, with pasta for 8.99. Would easily be 15.99 dine in. Best sandwiches around, made to order for takeout. 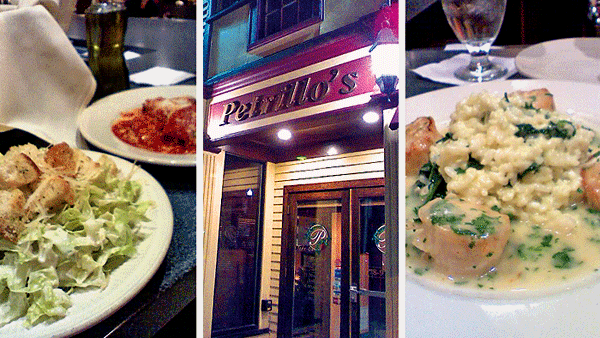 enjoyed Petrillo’s as well, lunch menu has a great selection too. Yes, I noticed that they have a separate entrance for take-out, so I guessed it’s a significant part of their business. Geoff, that chicken caprese sounds great. Might have to start going home from work by way of Peabody Square! Oh, and I obviously forgot to mention we had a caesar salad. It was very fresh and good, just eclipsed by that dreamy eggplant. Hands down one of the best restaurants north of Boston, my wife and I have been fans for several years. The takeout menu offers tremendous value, you can get the same entrees as dine-in for about 60% of the price.